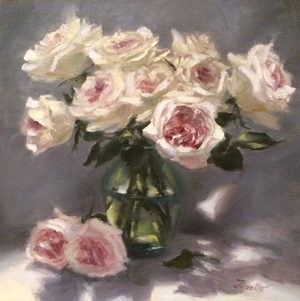 Experience a sense of timeless beauty in paintings by fine artist Pat Fiorello. In oil or watercolor, her paintings invite you into romantic landscapes or surround you with the color and movement of fresh, elegant flowers. In her luminous works, she uses rich color, dramatic light and shadow and painterly brushstrokes to create an impressionistic quality. She is well known for her floral paintings—which suggest a soft Impressionist style, but with her own distinctive contemporary touch. Often lush with foliage, bright flowers and European-inspired architecture, Pat’s landscape paintings can transport you to a place of beauty and serenity. An artist of note, Pat is also an inspiring and widely respected instructor. She teaches classes and workshops in the United States, the Caribbean and Europe. 2019 workshops include painting on location in New Zealand. Many of Pat's paintings of Europe are included in her recently published book "Bella Italia, Italy through the Eyes of an Artist". Custom paintings for your home or as a special gift can be created upon request. Given her love of flowers, commissioned paintings of bridal bouquets are one of Pat's specialities.